The Incorporated Society of the Crusade of Rescue and Homes for Destitute Catholic Children, usually known just as the Crusade of Rescue, was formed in 1899 to bring together together various childcare initiatives in the Catholic Diocese of Westminster. The various establishments operated by the Society included a number of homes or hostels for working boys. The first of these was the St Patrick's Home for Working Boys, founded in around 1896 by Father Clements, at 90 Charlotte Street, Fitzroy Square, with accommodation for 50 boys. At the end of 1896, the home was taken over by the St Vincent's Boys' Home on Harrow Road, run by Father Bans. On April 24th, 1899, St Patricks was officially certified as an Industrial School Home, allowing it to take boys who had been placed in custody by magistrates. During the latter part of their sentence, boys from Industrial Schools were typically released under licence and often then staying in working boys' homes, which provided supervision and support while they found their feet in employment. In 1902, St Patrick's relocated to larger premises at 14 Manette Street, Soho. The home, which could now house up to 75 boys, was recertified for Industrial School use on February 17th, 1902. It resigned its certificate on January 8th, 1906. St Patrick's appears to have cease operation by the time of the First World War. By 1930, the Society was operating the St George's Hostel at 4 Steele's Road, Haverstock Hill. In around 1935, the Blessed John Southworth Hostel was established at 49-55 Vauxhall Bridge Road, Lambeth. The following year, the St Thomas More Hostel was opened at 18a Compton Street, Bloomsbury. 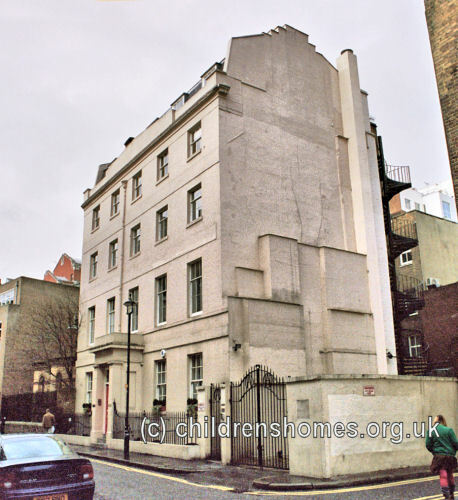 Try Catholic Children's Society (Westminster), [formerly the Crusade of Rescue] 73 St Charles Square, London W10 6EJ. To enquire about access to the records of a child who grew up in one of the Society's homes, fill in the request form on the Society's website.